If you’ve ever “ooh” ed and “ahh” ed over one of those TV shows that walk you through the homes of society’s most rich and famous, you’ve probably seen a kitchen (or five) that make your head spin. From amazing million dollar cottages in the mountains to tropical waterfront mansions on the Venetian Islands, Florida, gorgeous homes all over the country have one thing in common: Beautiful kitchens. Gourmet kitchens in some of the country’s most luxurious properties come with all of the bells and whistles, and some are bigger than our entire house. And although we can’t simply add a few hundred square feet onto our kitchen, there are a few things that you can do to your personal kitchen to upgrade it just like the millionaires do. You don’t need a fortune to have a kitchen that makes you feel like a VIP. In fact, there are many easy and inexpensive ways that you can do to make your kitchen worth a million bucks. Very rarely to luxury properties have a kitchen with basic, white walls. A pop of color in a kitchen can do wonders for this popular room, regardless of the size. Paint is one of the simplest ways to transform any room in your house, and that includes the kitchen. Dark hues work best for kitchens, and a growing trend in luxury properties across the country are darker toned cabinets and counter tops. If the only artwork in your kitchen is on your fridge, you may want to consider adding a few pieces to the walls. Kitchens of the rich and famous very rarely have blank walls, and incorporating art into the kitchen brightens up a blank wall and adds a little charm and personality to the space. For great artwork on a budget, check out your local flea market or farmer’s market, or ask an artsy friend to create a unique piece or two for you. Long gone are the days when tile was reserved for the floors. These days, high profile celebrities and the wealthy elite are choosing to an accent wall in the kitchens, giving it clean and polished look. Alternatively, a colorful backsplash that spans the perimeter of your kitchen, or even just on the wall behind the stove or sink is a great way to add a little flair to your kitchen. If using tile isn’t in the budget, oak is a popular finish that adds sophistication and style to your kitchen. It can be mind blowing that some luxury kitchens, like the Star Island estate homes, have light fixtures that cost more than our monthly mortgage payment, but unique lighting is a tried and true way to add style to your kitchen. Using hanging lights over the kitchen island is a popular technique in the luxury home design business, and can serve two purposes: it gives you plenty of room to see what you’re chopping/dicing/mixing/slicing, but it also adds an upscale touch to the whole room. Blinds in the kitchen are out, out, out. Windows are meant to let light flow in, and shouldn’t be blocked by outdated blinds. 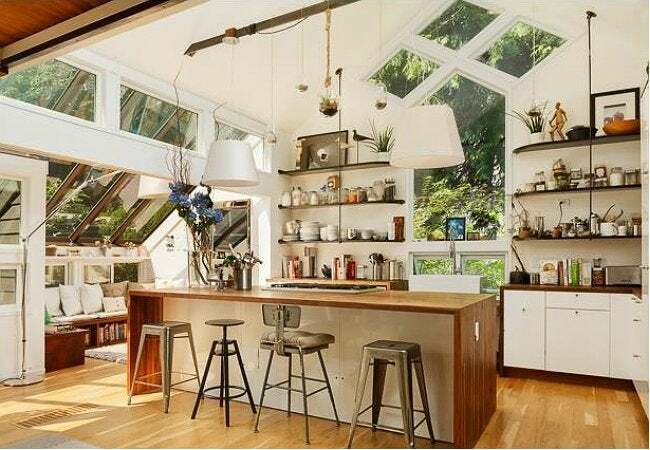 The kitchen is the best room in the house to let natural light come in, so take down the blinds and lighten up the place. While a millionaires kitchen may overlook the ocean, your view of your garden, grandchildren playing in the back, or simply nature is just as priceless. A popular (and practical) design element in many chef-inspired kitchens is the open shelving concept. Open shelves are popular above the sink and be a fashionable way to display cookbooks, your beloved salt and pepper shaker collection or picture frames add personality to the room. Bigger, more expensive upgrades like state of the art appliances, wine coolers, and imported materials like marble can help create a five-star kitchen of your dreams, but with a pretty hefty price tag. Uniquely upholstered chairs and bar stools, custom cabinets, cutting edge technology and the unique use of space are all popular ways to take your traditional kitchen up a notch. The kitchen is usually the central hub of the home; a place where families connect, eat, talk, and share together. 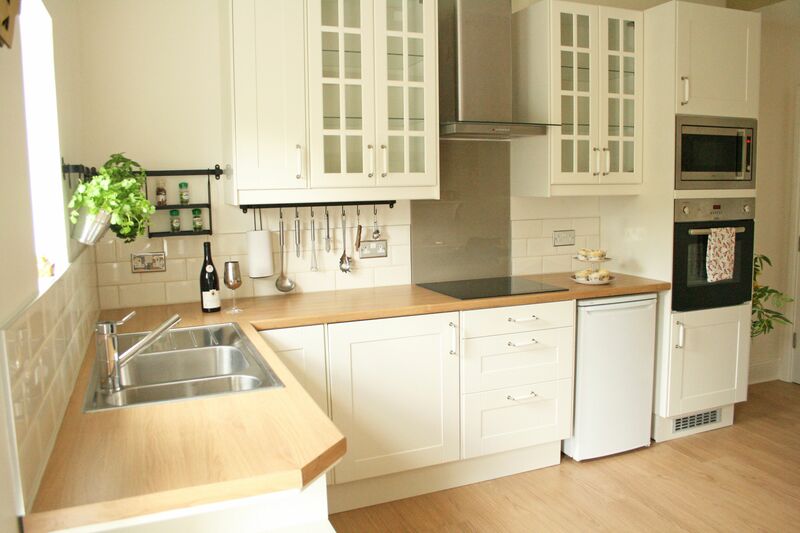 The function and feel of a kitchen are vital in the way the rest of the home operates.